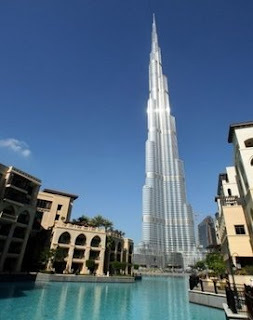 The world's tallest skyscraper opened today in Dubai, United Arab Emirates. 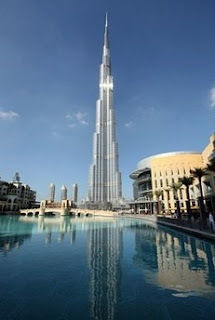 The tower, named Burj Khalifa after the leader of neighboring Abu Dhabi, stands 2717 feet tall (twice as tall as the Empire State building). The developer says the project cost $1.5 billion. It boasts four swimming pools, a private library and a hotel designed by Giorgio Armani. 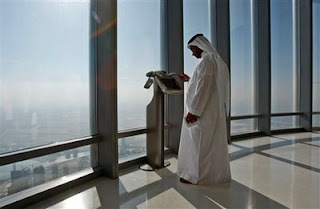 There are observation points in the tower that allow you to look out over the city. It is also equiped with "refuge floors" at 25 to 30 story intervals that are more fire resistant and have their own air supply in case of emergency. 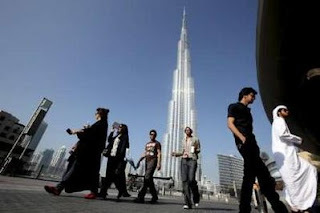 The entire building is reinforced by a concrete structure, which developers say makes it stronger than steel skyscrapers. 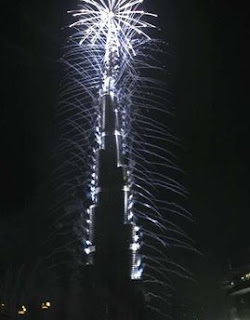 The tower's opening ceremony featured a laser light show as well as a fireworks presentation. You can read more about the tower, as well as see more pictures (including photos from the development stages) here.